East Logistics has been transporting goods to and from eastern Europe since 2000. Hence the name East Logistics. between Scandinavia and the European Continent, between Scandinavia and eastern Europe, and between the UK and Germany/Benelux, as well as cross trade, sea freight, air freight, courier and project transports. Today the company employs 28 members of staff in offices in Nykøbing Falster, Berlin, Bremen and Düsseldorf. The day-to-day management is handled by Jan Koch as CEO and Natacha Koch as COO. East Logistics was formed by Jan Koch in Nykøbing Falster on 1 November 2000. Jan Koch’s long-standing experience in the freight-forwarding sector had primarily focused on eastern Europe, which is why it only seemed natural to him to apply his expertise in his own company where the core area of expertise/niche would be transports between Denmark and eastern Europe. Hence the name East Logistics. The company grew to six employees already within the first year, thus laying the potential for growth. In subsequent years, the customer portfolio was enlarged to include transports between Sweden, Norway and eastern Europe, as well as overseas transports. East Logistics opened an office in Berlin in 2004. This paved the way for opportunities for new routes, which resulted in making the Berlin office primarily responsible for transports between the UK and Germany/Benelux. In 2006, East Logistics outgrew its office space, and Jan Koch purchased the present location at Frankrigsvej 7, Nykøbing Falster. Here the company has 1,000 square metres at its disposal, and the facilities have continuously been modernised and furnished to meet the company’s needs. To maintain East Logistics as a local workplace, Natacha Koch began working for the company in 2013. Natacha Koch is Jan Koch’s daughter and a qualified freight forwarder with considerable experience in the freight-forwarding sector. East Logistics acquired a freight-forwarding business on Lolland in September 2016. Six employees from this company have been transferred from here to the Nykøbing Falster office, enabling the company to increase its activities once again. As a result, East Logistics’ areas of expertise were widened to include transports between Scandinavia and the European Continent, and a project department was also added. In October 2017, East Logistics took over 2 offices in Germany; Bremen and Düsseldorf As a result, East Logistics has strengthened its position on the markets between Scandinavia and the continent of Europe. The company has grown and now has 8 new employees. For us at East Logistics, it is essential that all employees take the same basic approach to being part of the company. Our values build on this foundation: to be personal, punctual and reliable. Our values make it possible for us to achieve our goals of personalising the services we provide to our customers, ensuring that the goods are delivered on time and that we honour our agreements. We base our work on these values to create good teamwork in the company and to make it an attractive workplace. With us, you are guaranteed close, personal contact. We make a virtue of remembering our customers and knowing their needs. Our divisions are closely linked, both internally at the divisions, but also across the company. Our employees possess different skill-sets distributed over our transport routes, which is why we guarantee you professional and personal high-class advice. We are conscientious. Being punctual is a matter of course, which enables us to meet our customers’ requirements for deliveries on time. Punctuality is an essential aspect of our work culture and being punctual comes naturally to us. Reliability has been a core value from the very beginning of our company. If we were not reliable, we would not exist today. We are honest about which tasks we can perform, and we focus on what we are good at. To us, reliability has top priority so that when you, our customer, have entered into an agreement with us, you can always be sure that a deal is a deal. 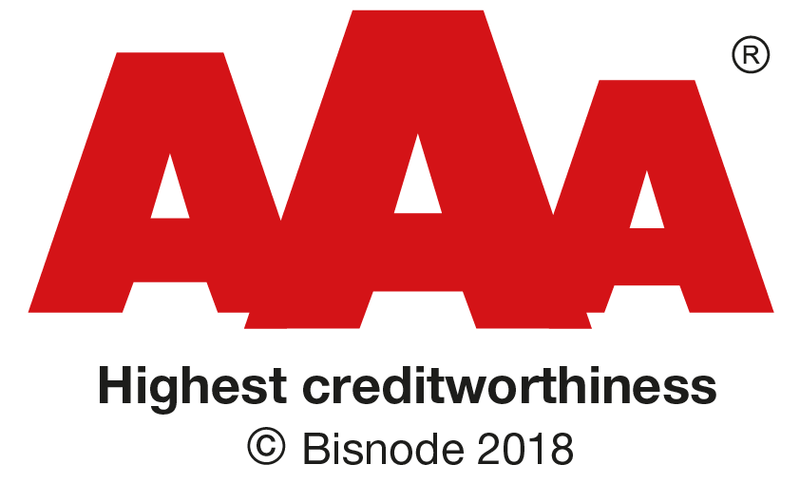 East Logistics are pleased to inform our clients and partners that we still have the highest credit rating possible, AAA. To us reliability has top priority and it is one of our core values and this is supported by the high credit rating. The badge means a lot to us because it proves, to our clients and partners, that we have a strong and healthy economy and that we are a trustworthy and solid partner to work with.